Remember when anyone with a few bucks, some fiberglass and a weird automotive vision could start a car company? It happened. You know the big names like Zimmer and Stutz and the small ones like the Leata Cabalero. But do you know the Pegasus? In its reporting on the auction, Sports Car Market noted the Pegasus wasn't quite a perfect specimen. It had "wide gaps at the hood and driver's door," "numerous paint issues" and a passenger's side-view mirror that was "melted from the sun," among other visible imperfections. Despite the condition, the Pegasus gaveled out at $33,000, a figure that led SPM's correspondent on the scene, whom for the sake of illustration we will call Captain Obvious, to conclude it was "very well sold." So what is a Pegasus, and where else might we have ever seen one? Turns out, at least three other places. Charlie Van Natter of Pasadena, Texas was one of those guys with a unique automotive vision. His vision was to attach an aggressive fiberglass body kit to a late-1980s Pontiac Trans Am and sell it, in the Houston area primarily, as a new car. Design-wise, the Pegasus 2000 — the only model created by Van Natter's Pegasus Motor Cars — looked a bit like a Ferrari 308 with the first 1/20th of a hammerhead shark grafted onto its nose. The fenders flared wildly over slightly wider tires, which from the side made the Pegasus look like it was wearing huge mud flaps. A bizarre rear section, aft of the C-pillar, merged the dual sins of a non-functional spoiler and a flared rear window. Indeed, it was a quite a shitshow, although by some 1980s standards it was probably on point. Before Barrett-Jackson, the most notable Pegasus coupe on the internet was a haggard-looking model, whose parched and faded paintjob marked years of neglect. A denizen of the LS1Tech.com forum spotted it at a Houston apartment complex four years ago, and the ensuing thread marks one of the only times on internet record that car enthusiasts addressed the Pegasus legacy. And Pegasus does have a legacy. Van Natter formed Pegasus Motorcars in 1988, and before the trademark ran out in 1997, he sold 25 Pegasus models, as reported in 2013 by the Mecum auction people. (Unfortunately, there's no Pegasus registry to consult.) At the time, the auction house listed a 1991 "Pegasus Pontiac Firebird Coupe" as a "Custom Hot Wheels Tribute Car," although the Hot Wheels connection is a bit dubious. Apparently, it was a "no sale" at the company's Houston auction in 2013. The Mask's high performance vehicle used in Intercontinental Releasing Corporations' [sic] action-adventure mystery, Behind The Mask was constructed for the motion picture by famous automotive designer, Charlie Van Natter. Van Natter equipped the car with all of the action gear seen in the movie, and it could reach speeds of up to 160 mph. 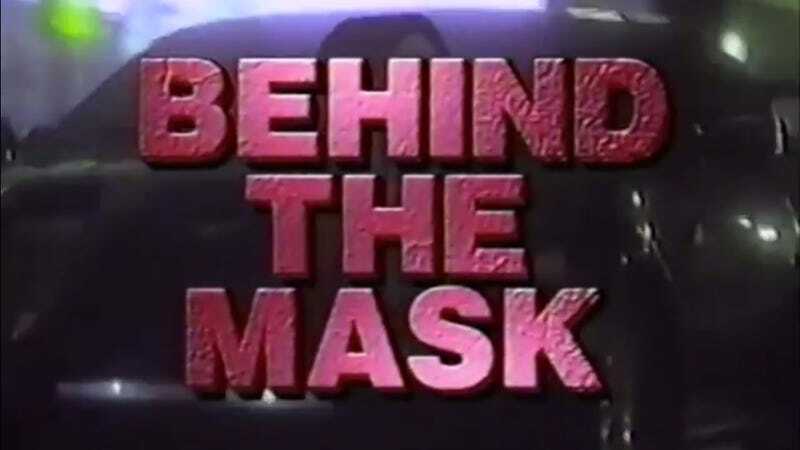 Watch the first 10 minutes of "Behind The Mask" on YouTube (see below), and it's clear the low-budget thriller is only slightly more ludicrous than your typical deep-back-catalog title found at any video store of the era after 10 pm on a Saturday evening. The Pegasus scenes are good for a few giggles. Still, in some tiny circle of Houston-area fans, "Behind The Mask" is probably a cult classic. Just like the Pegasus itself.